You slowly fight your way past a tour group of middle-aged Chinese couples, each brandishing their own selfie-stick like a sword. You stand up on pointe, feeling like a desperate ballerina, stretching this way and that in order to see over the army of sightseers. They are each battling it out for the same picture ‒ a selfie in front of the famed Japanese temple, Kinkaku-ji. 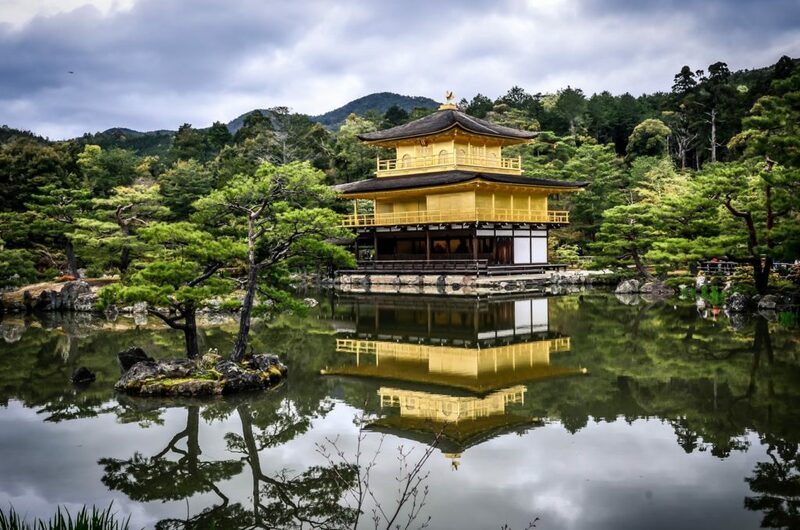 The global poster child for Kyoto’s many UNESCO World Heritage Sites, the temple, also known as the Golden Pavilion, has been at the top of your itinerary since your flight touched down in Narita Airport. When the battalion of tourists finally clears, you are met with a postcard-worthy vision of Japanese tradition. The Golden Pavilion is a building on fire. It is a temple dipped in liquid sun. It sits languidly atop a watery throne and is flanked by skinny pine tree soldiers. You feel your breath yanked out of you in one long spindle of awe and your hand flutters down to your own phone so that you too can snap a picture of this unforgettable moment. With some parts of its construction dating as far back as the 14th century, the Golden Pavilion originally served as a retirement villa for Ashikaga Yoshimitsu, a prestigious military commander from ancient times. Formally known as Rokuonji, the shining edifice was rededicated as a Zen Buddhist temple when the wealthy Yoshimitsu died in the year 1408. The interior is not open for public viewing, but those interested in seeing the building from more angles than just one will find a winding path that takes the awestruck tourist in a loop around the pavilion, leading them by the hand through beautiful Japanese gardens. Dressed in a kimono of gold leaf, Kinkaku-ji is Kyoto’s radiant crown and never ceases to inveigle millions of visitors into seeing it every year. Easily one of the most popular buildings in all of Japan, it has become vital for the tourist industry. 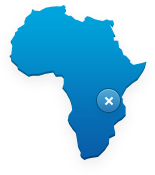 But it is just one of many attractions that you can’t miss on your trip around the country of the Rising Sun. It is not uncommon for a particularly popular tourist location to become a national icon that embodies the country as a whole — Big Ben, the Statue of Liberty, and the Taj Mahal to name just a few — and Mount Fuji is no different in that respect. This dormant volcano has long been associated with Japan and has become the very personification of the country’s unique culture. However, unlike any of those other man-made monuments, admiration for this natural phenomenon has been longstanding, influencing the Japanese people for millennia. Even in Japan’s earliest recorded literature, dating back as far as the 8th century, Mount Fuji is reverenced and looked to as a symbol of the land. The mountain is Japan’s tallest, capping at a grand total of around 12,388 feet (3776 meters) and was granted World Heritage status back in 2013. The climbing season starts in early July and ends in September, during which time thousands of people (foreign tourists and Japanese natives alike) climb up this iconic peak with an unparalleled vigor. If you make the choice to ramble up this mountainous trail during peak season, it may feel as if half the population of Tokyo is right there with you. But if the weather is cooperative, the fantastic panorama at the summit is well worth the stifling crowds and the uninteresting views on your way up. 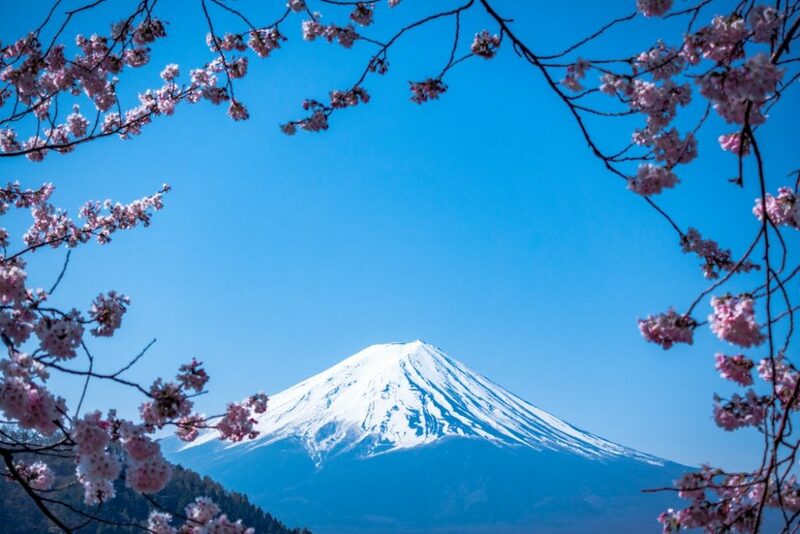 The old Japanese proverb, “He who climbs Mount Fuji once is a wise man, he who climbs it twice is a fool,” hints at the real difficulty of this trek. But don’t worry ‒ if scaling such a peak has you sweating at the very thought, take courage from the knowledge that you don’t have to do any climbing in order to simply enjoy Mount Fuji’s tranquil beauty. It’s near perfect symmetry can be appreciated from miles away, safe on the ground at various locations. Some particularly popular spots include the Fuji Five Lakes region at the northern foot of the mountain, and Hakone, a nearby hot spring resort. Aptly named, Tokyo Skytree looks like one long, thin neofuturistic tree slicing through the craziness that is the bustling city of Tokyo. It’s glowing lights thrum through the heavens; its metallic branches stretch towards the clouds. The building is a steel and glass masterpiece that truly looks like a glorified tree aspiring to become a star in the night sky. 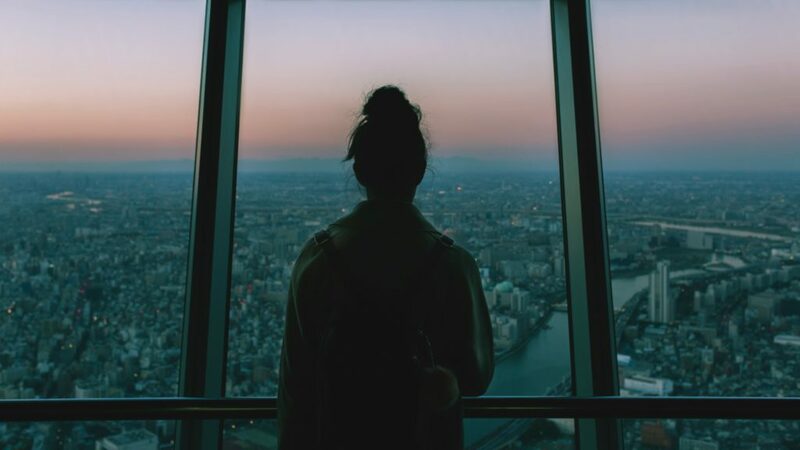 All poetics aside, Tokyo Skytree is a television broadcasting tower located in central Tokyo that is about 2,080 feet (634 meters) tall, making it the tallest structure in all of Japan. The tower offers a breathtaking, heart-stopping, hair-raising view of the city skyline that any tourist simply must see. Skytree Tower has two observation decks, located at heights of 1,148 feet (350 meters) and 1,476 feet (450 meters) respectively, making them the highest observation decks in all of Japan, and some of the most impressive in the world. The lower of the two decks is called the Tembo Deck, and spans three levels. The uppermost of these levels sports floor-to-ceiling windows that provide what most consider to be the best panoramic views of the city. Some of the attractions on the other floors include gift shops and delicious cafes so that you can eat while looking down on Tokyo far below. The second deck has been dubbed the Tembo Gallery, and is fondly referred to by most as, “The world’s highest skywalk.” It consists of a spiraling ramp that circles the tower like a snake, slithering up, up, and still farther up as you walk its sloping path. The dizzying heights make for a unique photo op and give the giddy sightseer a feeling of floating amidst the clouds. Kiyomizu Dera is an explosion of color and beauty, no matter the season you visit. In the springtime, cherry blossoms envelope the temple like pink cotton candy. In the summer, the trees shimmer a bright green that would not look out of place in a Bob Ross painting. The autumn brings with it a multi-colored quilt of yellow, red, and orange leaves and in the winter, if you are lucky, you might just see the holy temple dusted in a thin layer of powdered sugar-like snow. The name Kiyomizu Dera is literally translated to mean, “Pure Water Temple” and is one of the most celebrated temples in all of Japan. It hangs over the Otowa Waterfall in the eastern part of Kyoto and is nestled deep into wooded hills like a bear during hibernation. Listed as a UNESCO World Heritage Site, the beautiful temple is best known for its wooden pavilion which juts out over the cliffed hillside, the ground awaiting about forty feet (13 meters) below. From this traditionally-styled deck, you can drink in a fantastic view of the numerous cherry and maple trees dotting the area. 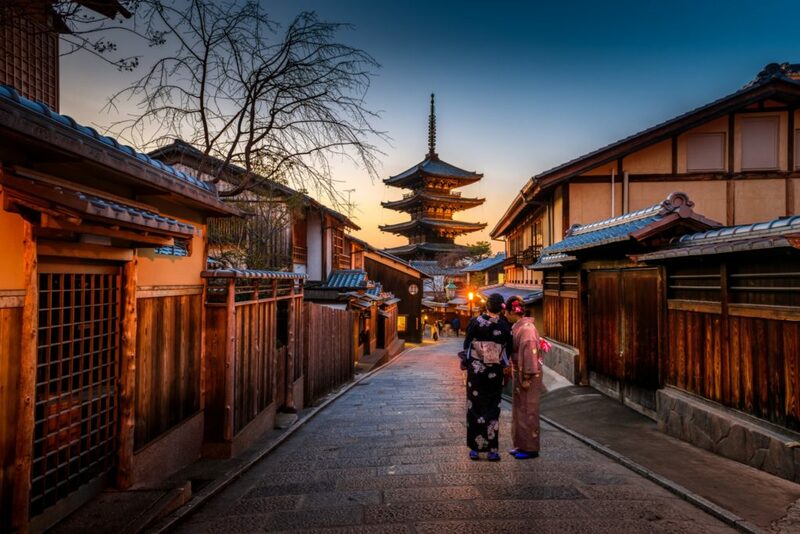 Locals and tourists alike love to don silken kimonos throughout the year as they visit this temple, adding to the timeless feel of the religious site.